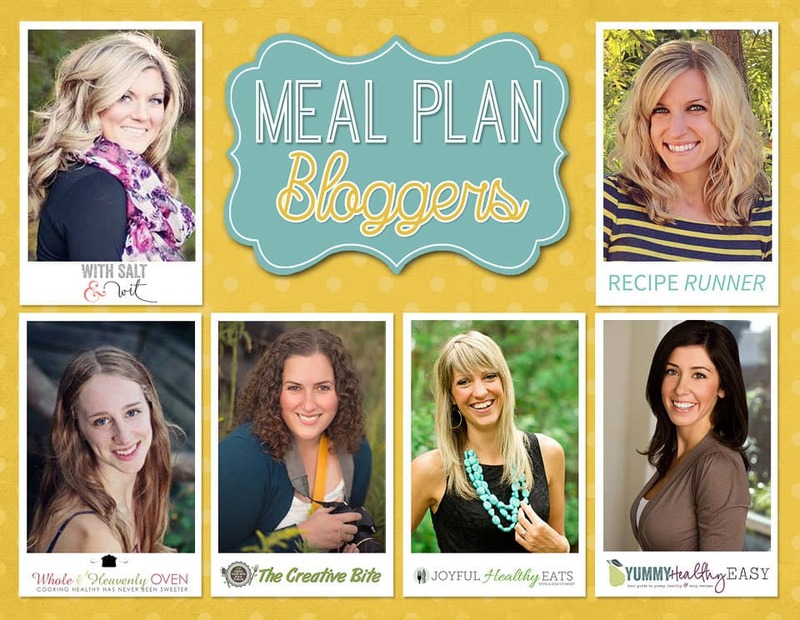 Hey, hey meal planners! Welcome back to your weekly meal plan! I don’t know about you but I can’t even believe we’ve turned the corner into FEBRUARY now!! The Superbowl is tomorrow, Valentine’s Day is coming up in a few weeks…and believe it or not, we’ve got recipes in today’s meal plan to get you ready for all that! Be sure to stop back every Saturday for our healthy weekly meal plan full of daily entrees as well as a breakfast, lunch, snack and dessert! Just click on the photo or link to see the recipe! Roasted Garlic, Spinach & Tomato Whole Wheat Pizza – satisfyingly healthy, vegetarian meal the whole family will love! Up your taco night game with these INSANELY-easy crockpot green chile chicken tacos! The chicken is unbelievably tender and a mango black bean salsa piled on top brings tons of flavor! Light Taco Rice Bake is an easy and hearty casserole full of lean ground beef, brown rice, corn and cottage cheese for a protein packed dinner that tastes amazing and satisfies your Mexican food craving! Paleo Baked Salmon that’s rubbed down with a sweet & spicy spice blend then topped with a fresh zesty Avocado Salsa! This easy healthy recipe is done in less than 30 minutes! 30 Minute Greek Turkey Meatball Gyros topped with a classic Tzatziki Sauce you’ll want to swim in! These Gyros are the perfect healthy dinner option for the family and clock in 429 calories! Woohoo! Light, tender Orange Almond Poppy Seed Muffins are perfect for your weekend breakfast or brunch! Full of fresh orange zest, two wholesome flours, poppy seeds, almond extract and topped with a sweet orange glaze for a decadent finishing touch! Winter Fruit & Shrimp Salad is a healthy entree salad filled with sweet pomegranate seeds and oranges, along with grilled shrimp and creamy goat cheese for a dinner idea that will brighten up these cold days. Baked Green Chile Chicken Taquitos are healthier and stuffed with the creamiest chicken and green chile filling! No game day is complete without wings! Honey Chipotle Crispy Baked Wings are an easy and healthy game dish! They are coated in a spicy chipotle rub, baked to crispy perfection then smothered in a honey lime sauce. Delicious fruit salsa with easy and delicious cinnamon chips. The perfect healthy snack/dessert to satisfy your sweet tooth! Ultimately soft and loaded with a double-whammy of chocolate, you would never guess that these irresistible double chocolate chip cookies use coconut oil and are completely BUTTER-FREE! Chicken enchilada cauliflower rice stuffed peppers are filled with southwestern, low carb cauliflower rice and mixed with cheesy, enchilada chicken. perfect to make ahead and bake later!